He did watch Joshua Cheptegei complete a Commonwealth Games double over 5000m and 10,000m and wonder if he could have done better, but Mo Farah insists he is revelling in the “new challenge” that is the marathon after leaving the track behind. The highly decorated Briton is returning to the scene of his only race over the 26.2-mile distance so far this coming weekend and feels in a very different place to when he first lined up on the Virgin Money London Marathon start line four years ago. On that occasion he ran 2:08:21 to break the English record but that time is far from the ceiling of his ambition. The multiple Olympic and world champion says he is learning about his new discipline, a process which will continue in the UK capital when he comes up against a field containing two of the fastest marathon runners in history – Kenya’s Eliud Kipchoge and Kenenisa Bekele of Ethiopia. 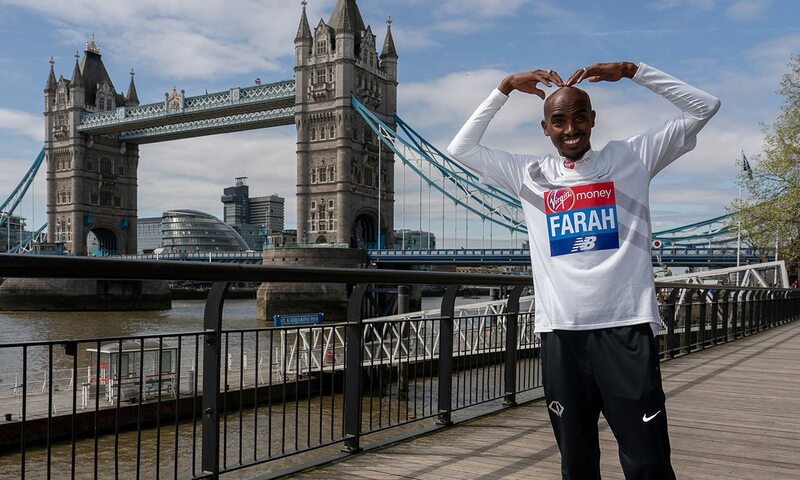 “I’ve definitely prepared differently from 2014,” says Farah, now coached by Gary Lough, husband of women’s world record-holder Paula Radcliffe. “Then I still had the track, I didn’t want to lose the speed and I had that at the back of my mind. “This time Gary and I have had a good chat, we’ve planned everything and the aim is just to go hard at it and see what we can do. The slightly longer-term aim is another shot at an Olympic medal in Tokyo 2020 and the 35-year-old feels his improvements will come gradually. “I think I first broke 13 minutes for 5000m in Zurich in 2010 and from then until I finished on the track I’ve been improving step by step. I think it’s going to be the same with the marathon. “If I’m going to come away with a medal from Tokyo then, each year, if I can run two marathons that would give me good confidence and I can learn about myself – the things you can do and can’t do. That’s why I had a great track career – I learned how to win races, put off the opposition and be strong mentally and physically. “I think, in the marathon, physically I am strong and mentally I have to start practicing. He added: “The field is strong but our aim is to go with our own plan and see what we can do. “The aim is to go after the British record (Steve Jones’ mark of 2:07:13) for sure but, at the same time, in my mind since 2014 until now I’ve learned more and understand a lot more. We’ll see what happens. That has been evident in the past two showpiece marathons, with surprises being sprung in the almost apocalyptic conditions of Boston, while Callum Hawkins’ struggle in the heat of the Commonwealth Games, when he collapsed while leading and within 2km of the finish, disturbed many. The delay in the Scot receiving medical attention has been the source of much comment. The temperature reached 28 degrees in Australia but, despite warm weather forecast for London, current predictions for race day currently stand at 21 degrees. Farah is not anticipating suffering the same fate as Hawkins and has full confidence in the extensive medical team which will be in position throughout the London course. “I saw a clip of Callum when he collapsed. I was obviously devastated at the time seeing that,” said Farah. “But he’s a great fighter and that’s what Callum does. He will go all the way, he will go as hard as he can, he will push and try and break the guys. London Race Director Hugh Brasher added: “We have an incredible medical team and we have a host of doctors and medical facilities around the course. We have a myriad of contingencies in place for warmer conditions. “We’ve had the marathon in 22 degrees before. At the moment the temperature here is to be about 21 degrees with some wind which will reduce it to about 18 degrees and it’s not to peak until later in the afternoon.